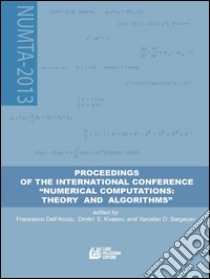 This book contains Proceedings of the International Conference and Summer School NUMTA-2013 “Numerical Computations: Theory and Algorithms”. The Conference is organized jointly by the University of Calabria, Italy, and by the N.I. Lobachevsky State University of Nizhni Novgorod, Russia in cooperation with the Society for Industrial and Applied Mathematics (SIAM), USA. The goal of the Conference is to create a multidisciplinary round table for an open discussion on numerical modeling nature by using traditional and emerging computational paradigms. The Conference discusses all aspects of numerical computations and modeling from foundations and philosophy to advanced numerical techniques. New technological challenges and fundamental ideas from theoretical computer science, linguistic, logic, set theory, and philosophy meet requirements and new fresh applications from physics, chemistry, biology, and economy.